Summary: Diffuse infiltrating retinoblastoma is a rare form of retinoblastoma. 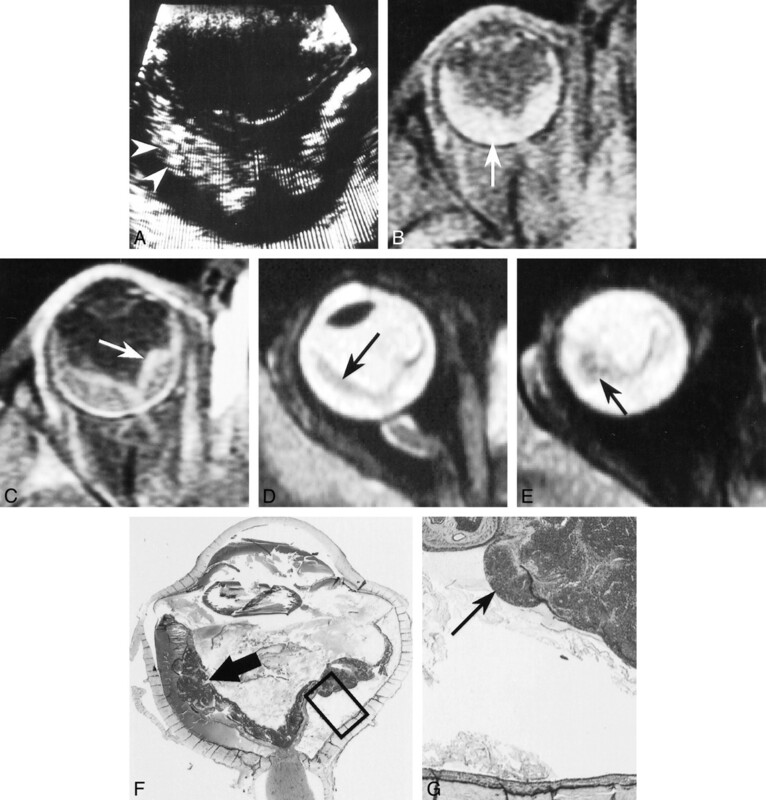 We report two cases of this disease in which sonographic, CT, and MR imaging findings were compared with histologic studies obtained after enucleation. Although nonspecific, MR imaging provides valuable morphologic data for the diagnosis of diffuse infiltrating retinoblastoma and may help in decisions regarding enucleation. Diffuse infiltrating retinoblastoma is a rare histologic form of retinoblastoma characterized by diffuse infiltration of the retina without a tumor mass. The first series was published in 1960 by Schofield (1), and a review of the literature by Bhatnagar and Vine in 1991 (2) included only 34 cases. This form is misleading for both ophthalmologists and radiologists, because of its atypical clinical presentation and because calcifications, the major sign of retinoblastoma on imaging studies, are absent in the majority of cases. The diagnosis is frequently delayed, with a mean lag time of 5 months from presentation (2). Retinoblastoma constitutes a therapeutic emergency in view of the very poor prognosis of forms with extraocular dissemination, and thus timely diagnosis is critical. Sonographic and CT descriptions of this entity are rare (2–6), and only one report of the MR findings has been published to date (6). MR imaging is considered to be the best imaging technique for the differential diagnosis between retinoblastoma and pseudoneoplastic lesions (6). In this article, we report two new cases of diffuse infiltrating retinoblastoma investigated by sonography, CT, and MR imaging in which the radiologic studies were compared with histologic findings. We also discuss the main differential diagnoses and propose a clinical and radiologic investigative strategy for these retinoblastomas, which are difficult to diagnose. A 3½-year-old boy presented with leukokoria. An ophthalmologic examination revealed posterior synechiae, suggestive of possible inflammation, and total retinal detachment. The patient had no family history of retinoblastoma. On sonography (Fig 1A), the retina appeared to be detached and markedly thickened, with a cystic appearance within the mass, and no identifiable calcification. A CT study (Fig 1B) showed a heterogeneous crescent-shaped hyperdensity of the posterior pole, predominantly involving the temporal quadrants, with no calcification. 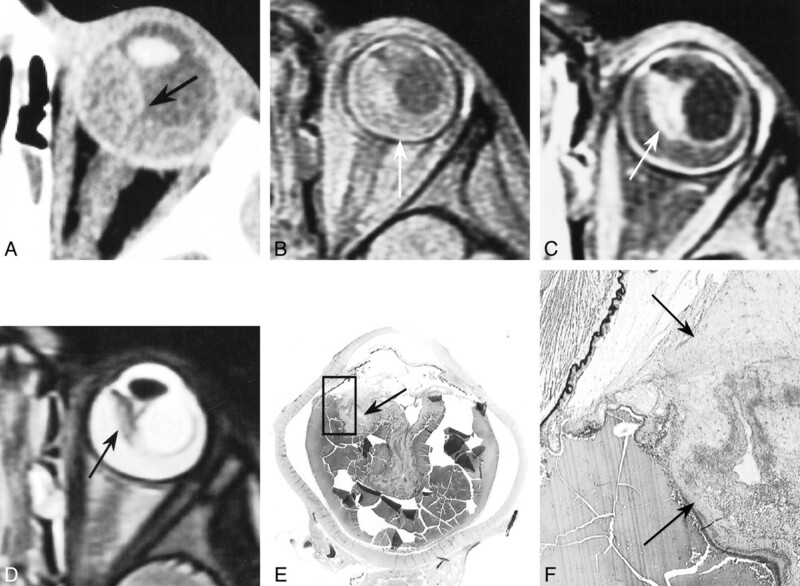 Unenhanced T1-weighted MR images (Fig 1C–E) showed signs of retinal detachment containing material with a high signal intensity relative to the vitreous. 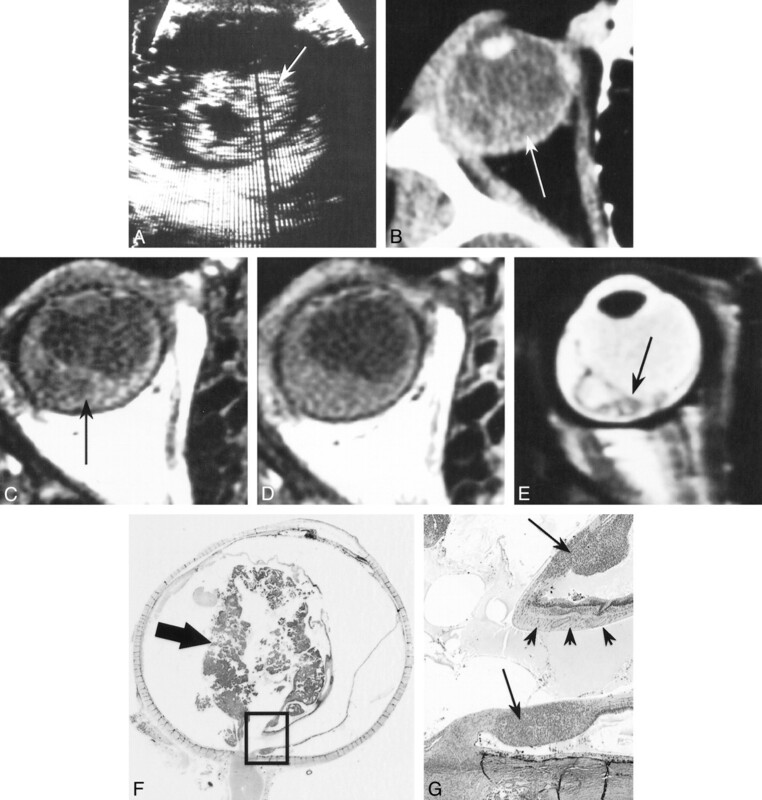 Contrast-enhanced MR images showed moderate enhancement of the zone of detachment. The T2-weighted sequence showed an irregular, markedly thickened, detached retina, containing micronodules with relatively low signal intensity. The optic nerve was normal in appearance. Patient 1: 3½-year-old boy with leukokoria, posterior synechiae, and total retinal detachment. A, Sonogram shows detachment and thickening of the retina (arrow). B, Contrast-enhanced CT scan shows crescent-shaped hyperdensity of the posterior pole due to retinal detachment (arrow), with no calcification. C and D, Unenhanced (C) and enhanced (D) T1-weighted MR images show retinal detachment containing material with a high signal intensity (arrow, C) and moderate enhancement of the zone of detachment. E, T2-weighted MR image shows an irregularly thickened, detached retina (arrow). After enucleation, histologic examination (Fig 1F and G) revealed an exophytic, infiltrating, poorly differentiated, noncalcified retinoblastoma, associated with edema of the iris, sparing the choroid, anterior chamber, and optic nerve, as well as its meningeal sheaths. The interval between onset of the first symptoms and enucleation was 2 months. The patient did not receive any adjuvant therapy and was well at the last follow-up examination 33 months after surgery. A 3-year-old girl presented with leukokoria associated with a mildly red and painful eye. An ophthalmologic examination revealed dense vitreous opacities, total retinal detachment with preretinal nodules, and neovascularization of the iris. The patient had no family history of retinoblastoma. On sonography (Fig 2A), the retina appeared detached and thickened, with two hyperreflective micronodules in the temporal detached retina. A CT study (not shown) showed retinal detachment and punctate calcification in the temporal territory. UnenhancedT1-weighted MR images (Fig 2B–E) showed total retinal detachment, and the subretinal space was frankly hyperintense relative to the vitreous. Contrast-enhanced sequences showed marked enhancement of retinal leaflets with a locally nodular appearance. The T2-weighted sequence showed a detached and locally thickened retina with relatively low signal intensity. The optic nerve was normal in appearance. Patient 2: 3-year-old girl with leukokoria, red and painful eye, vitreous opacities, total retinal detachment, and neovascularization of the iris. A, Sonogram shows detachment and thickening of the retina with two hyperreflective micronodules (arrowheads). B and C, Unenhanced (B) and enhanced (C) T1-weighted MR images show retinal detachment with frankly hyperintense subretinal space as compared with the vitreous (arrow, B) and locally nodular enhancement (arrow, C) of detached retinal leaflets. D and E, T2-weighted MR images show detached retina with localized thickening and relatively low signal intensity (arrows). After enucleation, histologic examination (Fig 2F and G) revealed an infiltrating and endophytic, moderately differentiated, retinoblastoma containing rare microcalcifications, which infiltrated the vitreous but spared the choroid, anterior chamber, and optic nerve and its meningeal sheaths. The interval between onset of the first symptoms and enucleation was3 months. The child did not receive any adjuvant therapy and was well at the last follow-up examination 45 months after surgery. Diffuse infiltrating retinoblastoma is rare, with an estimated prevalence of 1.4% of all retinoblastomas (7). This form generally presents at a more advanced age than the typical unilateral form(6 years versus 24 months), but has been reported in children between the ages of 1 and 11 years (2). It occurs more frequently in boys, with a male:female ratio of 1.8:1.0. It is consistently reported as being unilateral and sporadic, and no cases of second tumor have been described (2). Pseudoinflammation is a common presenting sign (24% versus only 6% in the classic form), whereas leukokoria is relatively rare (24% versus 63% in the classic form). On clinical examination, pseudohypopyon is a suggestive sign, observed in 59% of cases (2, 7–9). This sign corresponds to a whitish crescent-shaped deposit of tumor cells in the anterior chamber. Compared with a true hypopyon, these discohesive cells shift more readily with a change in the child's head position (8). In view of the unilateral nature of the tumor, the extent of retinal infiltration, and the frequency of vitreous dissemination, enucleation is the treatment of choice for diffuse infiltrating retinoblastoma (9). The decision to administer adjuvant therapy is based on histopathologic risk factors, according to the management of unilateral retinoblastoma (10). This slowly progressing form (7) might have a better prognosis than typical retinoblastoma, as it appears to have a favorable course, despite the frequently delayed diagnosis (4, 7). In the review by Bhatnagar and Vine (2), only one death was reported in a series of 28 cases with a mean follow-up period of 6.5 years. Anatomically, this form is characterized by diffuse infiltration of the various layers of the retina (7). Vitreous invasion from infiltrated zones is frequent, as in endophytic retinoblastomas, which grow toward the center of the eye. Retinal detachment is also possible, as in exophytic retinoblastomas, which, on the contrary, show peripheral growth in the subretinal space (6). Extension to the anterior chamber can occur via the ciliary processes and the iris. Infiltration of the choroid and optic nerve may also be observed (7). Calcifications have been observed in histologic sections in only 14% of cases, versus 95% in the typical forms (2). The reported sonographic findings include retinal detachment, retinal thickening, and nonspecific hyperechogenicity of the vitreous (2, 4). A detached and markedly thickened retina was observed in both our cases, although this finding was reported in only one of the seven cases in the review by Bhatnagar and Vine (2). The first reports of the CT findings of infiltrating retinoblastoma (3, 4) described punctate calcification, as in our case 2, and calcifications were observed in two of five cases in the review by Bhatnagar and Vine (2). However, CT may only reveal a subretinal exudate with a spontaneous density greater than that of the residual vitreous (6). On MR images, the histologic form reported by Kaufman et al (6) comprised a large exophytic component, accounting for the described appearance of an exophytic mass with relatively high signal intensity on T1-weighted sequences, low signal intensity on T2-weighted sequences, and moderate contrast enhancement. Both our cases showed signs of retinal detachment containing material with spontaneous high signal intensity on T1- and T2-weighted sequences, probably due to the hemorrhagic content or the higher protein or lipid content as compared with the vitreous. The detached retinal leaflets appeared to be diffusely thickened, irregular, and locally nodular. This appearance was clearly observed on T2-weighted sequences in both cases. On the T1-weighted study in case 1, the retinal leaflets were partially visible spontaneously, but were no longer visible on the contrast-enhanced sequence, probably because of the combined enhancement of the infiltrated retina and the exophytic component. On the contrary, in case 2, the infiltrated retinal leaflets were only visible on the contrast-enhanced sequence, probably because of the lack of enhancement of the subretinal exudate in an infiltrating and endophytic form, without any exophytic component. Many diseases can simulate retinoblastoma (6). However, in a clinical and radiologic context of diffuse infiltrating retinoblastoma with a normal-sized eye, the two main differential diagnoses to be considered are Coats disease and toxocariasis. Coats disease is a sporadic form of primary retinal telangiectasia, affecting children at a mean age of7 years, with a male predominance, and is unilateral in 80% to 90% of cases. It evolves toward aneurysms that can induce subretinal exudates, retinal detachment, and intraretinal gliosis or fibrosis (11). When the patient is examined for the first time at an advanced stage of the disease, the clinical and radiologic presentation may resemble that of diffuse infiltrating retinoblastoma. Imaging studies of advanced forms of Coats disease show retinal detachment and a subretinal exudate with spontaneous high density on CT scans and high signal intensity on T1- and T2-weighted MR images. Calcifications are rare and observed late in the course, due to the evolution of subretinal hematomas. Linear enhancement of retinal leaflets is observed on contrast-enhanced CT and MR studies (11). According to Edward et al (11), images with a low-intensity signal on T2-weighted sequences are rare in Coats disease, in contrast to retinoblastoma. Another major distinctive criterion in favor of Coats disease is the absence of a contrast-enhanced mass in the subretinal exudate (11). However, these diagnostic criteria are of low value for a differential diagnosis with the diffuse infiltrating form of retinoblastoma, because in this form, calcification are usually absent, and subretinal exudate may have the same density and signal. Furthermore, as the exophytic component may be absent or minimal, a contrast-enhanced mass in the subretinal space may be absent, as in our case 2. Finally, the presence of a contrast-enhanced mass within the detached retina with a low-intensity signal on T2-weighted sequences does not exclude Coats disease, since, as illustrated in one of our cases (Fig 3), intraretinal fibrous nodules may also appear as infiltrating masses with a low-intensity signal on T2-weighted sequences, and can enhanced markedly after contrast injection, owing to the associated capillary hyperplasia. Thus, when no calcification is seen on sonographic or CT examination, the differential diagnosis between Coats disease and infiltrative retinoblastoma may be impossible. Because the detached retina in Coats disease is usually linear, irregularities and nodules within the thickened retina on sonograms or MR images may be an important indicator of retinoblastoma, but this will have to be confirmed in larger series. Coats disease in a 2½-year-old boy who presented with strabismus and red eye. Retinal detachment and a whitish mass behind the lens were found on examination of the ocular fundus. A, Contrast-enhanced CT scan shows large hyperdense detachment (arrow). B and C, Unenhanced (B) and enhanced (C) T1-weighted MR images show retinal detachment containing material with high signal intensity (arrow, B) and enhancement of the detached retina, forming a mass in the nasal territory (arrow, C). D, T2-weighted MR image shows the mass has relatively low signal intensity (arrow). Toxocariasis is a parasitic chorioretinitis (Toxocara canis) affecting children between the ages of 6 and 12 years, with a female predominance. It is usually unilateral and induces intraretinal granulomas, lesions of the vitreous and retinal detachment (6). Sonographic findings include a solid, hyperreflective peripheral mass, vitreous band, or membranes extending between the posterior pole and the mass, and traction retinal detachment or a fold from the posterior pole to the mass (12). CT findings consist of nonspecific retinal detachment and subretinal exudate, without associated calcification (13). Granulomas present as contrast-enhanced retinal nodules on MR images that can also simulate retinoblastoma nodules (6). When in doubt about the diagnosis, we recommend an examination of the ocular fundus under general anesthesia by a specialized ophthalmologist, toxocariasis serology, and complete imaging. On the basis of our experience, we conclude that imaging must include sonography, unenhanced CT, and unenhanced and enhanced MR studies. Calcifications are rare, but they constitute a major diagnostic argument for retinoblastoma, especially in children under the age of 3 years (3). The MR imaging technique must be optimized by using surface coils and a contrast-enhanced series with fat suppression or with subtraction of unenhanced and contrast-enhanced series to allow more precise analysis of retinal leaflets and the pattern of enhancement. Following this assessment, depending on the level of suspicion of retinoblastoma, two approaches may be considered: either immediate enucleation when retinoblastoma is highly suspected, especially when the eye is no longer functional, or, when retinoblastoma is minimally suspected, anterior chamber paracentesis may be considered for cytology, neuron-specific enolase assay, and toxocariasis markers. The sensitivity of paracentesis for the diagnosis of retinoblastoma in this circumstance is estimated to be 86% (2). However, this procedure should only be considered in exceptional situations, as it carries a risk of tumor spread along the needle track. Diagnosis of diffuse infiltrating retinoblastoma is a challenge both for ophthalmologists and radiologists. Improvement in imaging techniques, notably the advent of high-frequency sonography and high-resolution MR imaging, and better imaging analysis based on histologic comparisons, may facilitate the diagnosis and management of this atypical form of retinoblastoma. We thank Marie-Thérèse Iba-Zizen (Centre Hospitalier National d'Ophtalmologie des Quinze-Vingts, Paris) for her assistance with imaging. ↵1 Address reprint requests to Dr. Hervé Brisse, Service de Radiodiagnostic, Institut Curie, 26 rue d'Ulm 75005 Paris, France.